This is an experimental version so some problems may be found when using it on systems which do not use the default POPFile settings or when transferring data between different versions of POPFile. If things go wrong, log reports and backup copies of some key files are available to help repair things. 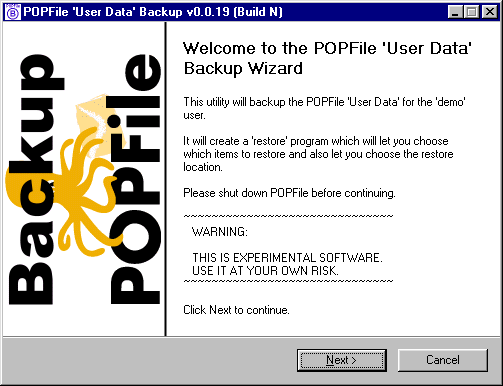 This is an experimental version of the POPFile 'User Data' Backup/Restore Utility for Windows. This utility is really in two parts: the 'Backup' wizard makes a backup of important files from the 'User Data' folder and the 'Restore' wizard allows these files to be restored to a location selected by the user. With the exception of the SQL database dump and the Recent Messages, all of these items are automatically backed up if they can be found. 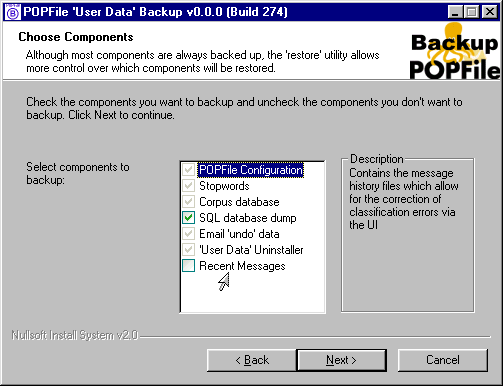 A summary page is displayed to allow the user to review (and change) the settings before starting the backup operation. The 'Backup' wizard then creates a single executable file containing all of the backed up data and a program to allow this data to be restored. A timestamped backup log report is saved in the 'User Data' folder as a record of what was backed up. Although this build can backup SQLite 3.x format databases, it cannot generate SQL dumps for them (because it uses sqlite.exe to generate the dumps and sqlite.exe does not work with SQLite 3.x format databases). The executable file created by the 'Backup' wizard is in fact a customised installer which allows the user to choose which items are to be restored and the 'User Data' folder where the selected item(s) should be restored. So although the backup may contain all of the items in the above list the user can, for example, choose to restore only the list of ignored words. A summary page is displayed to allow the user to review (and change) the settings before starting the restore operation. If the 'Restore' wizard finds an existing copy of any of the following files during the restore operation, it will rename the existing file to avoid overwriting it (e.g. 'stopwords' will be renamed to 'stopwords.bk1' before the 'stopwords' file gets restored). Up to 3 renamed copies of a file will be retained, as a safety measure (see the sample restore report for some examples). If an existing BerkeleyDB or flat-file corpus is found when restoring a BerkeleyDB or flat-file corpus, the user will be asked if the existing one can be deleted before the corpus is restored. The Recent Messages are handled in a similar fashion. The 'Restore' wizard saves a timestamped restore log report in the 'User Data' folder used for the restore operation. Details of any files which were renamed during the restore operation are listed in the report. The POPFile 'User Data' Backup/Restore Utility tries to cope with more than just the current official release of POPFile but much more work still has to be done to improve the utility. So care should be exercised if attempts are made to restore data to a system (or installation) which uses a different version of POPFile. 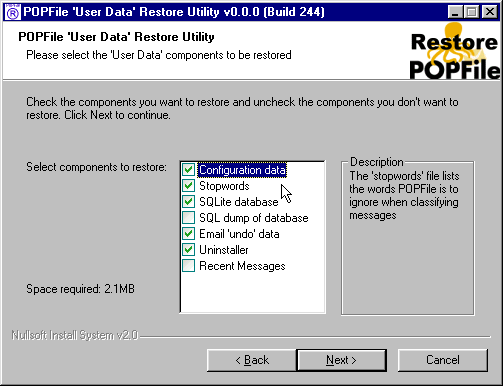 The 'Restore' wizard will attempt to alert the user if data is being restored to a different version of POPFile from the one to which the original data belonged (but it is still up to the user to determine if the restore operation should be performed).